Are “Safe” Playgrounds Really Benefiting Children? 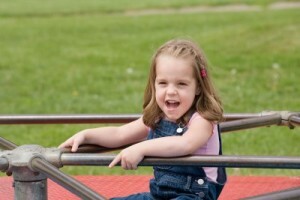 Home » Are “Safe” Playgrounds Really Benefiting Children? Do you remember the merry-go-round? What about the really tall metal slide that you could zoom down in three seconds flat? Weren’t they the greatest? As I kid, I remember these two playground items having the longest line but it was so worth it when you finally got your turn! Sadly, however, these playground items, along with many others have been removed from playgrounds all across the country for safety reasons. The U.S. Consumer Product Safety Commission estimates that 200,000 children end up in the emergency room from playground injuries. In a ten year period, 1990 to 2000, 147 of those injuries resulted in death. These injuries are the reason that so much of the beloved playground equipment we used to play on has practically disappeared. The real question is whether or not the removal of the equipment is really benefitting our children. According to some pediatric experts, the answer is no. While injuries on the playground have started to decline, children are becoming bored with the equipment offered. They don’t feel challenged. And, worst of all, they are not being adequately prepared for real life and may even lack the varied stimulation they need to develop both physically and mentally. Another point that was made by the experts is that many of the playground injuries are likely to occur, no matter how safe the equipment is. My children are a wonderful example. As a mother of four boys, three over the age of 7, we have our share of play-related injuries, most of which happen in our own home. I am constantly telling them to save it for the playground. Yet, because of the lack of challenging activity on the playground, my older boys rarely want to play when we are there. I am more likely to receive groans when I announce we are going to the playground than cheers. The boys are bored. They try to find ways to be content because they know that their younger siblings enjoy it there. Yet, within an hour, they are more than ready to go home. So, my little daredevils choose to scale walls to receive the challenging play they so desire. They perform stunts on dirt bikes and jump off of things that are definitely not safe. And, while I worry sometimes and intervene when necessary, I realize that this is a part of growing up. That risky play is fun and it can help you learn your limitations. Let me tell you, it only took one time hitting my knee on the merry-go-round for me to learn my lesson. Of course, there is still the issue of safety. Any child, risk taker or not, can fall and we do want our children to be safe while on the playground. But where do we draw the line between safety and fun? According to the experts, there is a way to have both fun and safety. Focusing on landing areas while still allowing some of the challenging, fun and risky equipment could help cushion the falls of the children, reducing the chances of injury. This would promote safety while still giving all children, including rambunctious ones, the challenges that keep them playing and learning. Mommy Date ~ Angelina Treats Her Kids To A Private Screening of Harry Potter!